Located in Lewes, DE,. 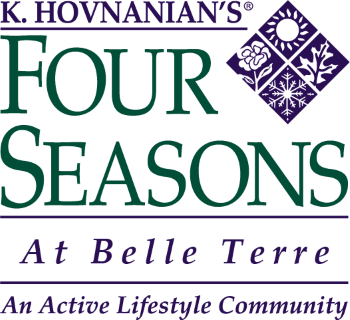 K. Hovnanian's® Four Seasons at Belle Terre is a 55+ active lifestyle community featuring low-maintenance single family homes. K. Hovnanian® Homes has decades of expertise curating exceptional active lifestyles for those 55 or better. At Belle Terre, residents will enjoy a 6,000 sq. ft. clubhouse with outdoor pool, as well as a state-of-the-art fitness center, billiards room, game room, lounge and aerobics room. Step outside to enjoy an extensive trail system, fire pit, outdoor kitchen, pickle ball and bocce courts. With an ideal location close to Rehoboth and Lewes Beach, you'll spend your days with friends and family soaking up the sun or cruising the boardwalk, all in tax-free Sussex County, Delaware. Other nearby conveniences include a variety of public and private golf courses, and Tanger® Outlets, just 2 miles away from the community. Schedule a tour today to preview three fully-decorated model homes and discover your ideal lifestyle!